As smartphones keep getting bigger, the hands holding them seem to be getting smaller. 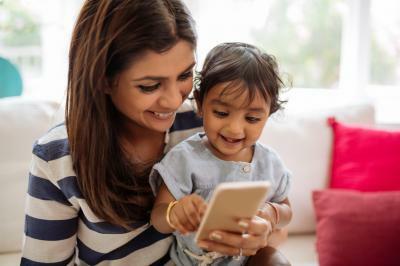 According to research from Influence Central, the average age at which a child gets a smartphone today is 10, down from 12 just four years ago. By age 11, most kids also have a social media account. Is it any wonder that parents often ask their kids how to work the digital devices that pervade our existence today? While today's generation of young people are uniquely knowledgeable about everything digital, bankers may be shocked to find out new employees may be remarkably lacking in basic understanding of finance. This is because these days as kids move through high school and into college, they tend to get little or no instruction in basic personal finance. As they approach adulthood, they may find themselves adept at downloading banking apps but having only a sketchy understanding of how the whole banking thing works. Consider some supporting data that finds most students now graduate high school without having ever encountered a class where basic personal finance was covered. In fact, only 17 states today mandate that schools provide ANY instruction in personal finance and only 20 states require high school students to take economics. It should come as no surprise then, that community banks may have a difficult time with younger hires occasionally. After all, these young adults (and customers) have likely grown up with so little exposure to banking or personal finance that they may find it challenging or perhaps even odd. While banks must work on ways to better address and engage younger generations, they also should recognize the need to start engaging earlier perhaps. That way kids will grow up and hopefully have the skills and basic knowledge needed to run their personal finances, businesses, and understand the importance of maintaining and using bank accounts. After all, if children are smart enough to operate complicated digital devices at the age of 10, shouldn't they be able to handle bank accounts? Bank of America for one seems to think so. They have a special website section for parents and teens in fact. There, they point out that teens between 12 and 17 get their money from allowance (40%), direct from parent (32%), working or a job (13%), gifts (9%) and other (6%). Perhaps more interesting is the fact that BofA has a whole section dedicated to this and on demand ways for parents of kids to open accounts, talk to someone, etc. so they must be using it to capture and groom new customers for something bigger that eventually comes later on down the road. Community banks are uniquely positioned to play a key role in the quest of improving financial literacy for the next generation and it is in all of our interests. Community banks tend to be more connected to their communities than large and impersonal banks, and so are more likely to understand the particular needs and requirements of local schools. Engaging with schools and students has the potential to make young people more comfortable and capable when it comes to banking relationships. In addition, banks that engage early can gain an edge when the time comes for these students to establish their own banking relationships, seek jobs or take over businesses from their parents. When today's 10-year-old becomes tomorrow's young adult, maybe the mobile banking app loaded onto his or her smartphone will be the one from the community bank that was on the elementary school field trip. Yields initially fell after a soft August employment report, but rebounded to end up 3bp, after Richmond Fed President Lacker said the economy was strong enough to warrant "significantly higher" interest rates. 1) United Roosevelt Savings Bank ($98mm, NJ) will acquire Wawel Bank ($73mm, NJ) for about $4.4mm in cash. 2) AltaPacific Bank ($354mm, CA) will acquire Commerce Bank of Temecula Valley ($71mm, CA) for about $15.9mm in cash (50%) and stock (50%). A KPMG survey of 100 executives at banks with assets between $1B and $20B finds the percentage of total operating costs driven by regulatory compliance requirements are 11% to 20% (47%), 5% to 10% (40%), 21% to 30% (8%) and less than 5% (5%). Research by the Society for HR Management finds the top business travel benefits offered by companies nationwide are: reimbursement for airport parking while on business travel (88%), reimbursement for taxi or car service (87%), mileage reimbursement for the use of personal car to/from airport (79%), per diem for meals (76%), allowing employee to keep hotel points (68%), allowing employee to keep frequent flyer miles (67%), paid internet access while on business travel (58%), travel accident insurance (41%), and reimbursement for telephone calls while on biz travel (33%). The FDIC reported efficiency ratios for various asset size groups as follows: <$100mm (74.7%); $100mm to $1B (68.1%), $1B to $10B (61.6%), $10B to $250B (54.8%) and $250B or > (57.1%). The difference between the lowest and highest is 36%. Research by Hyperwallet finds that while 25% of Americans have no real savings, some 70% of freelancers and contractors (1099 workers) say they have nothing saved.